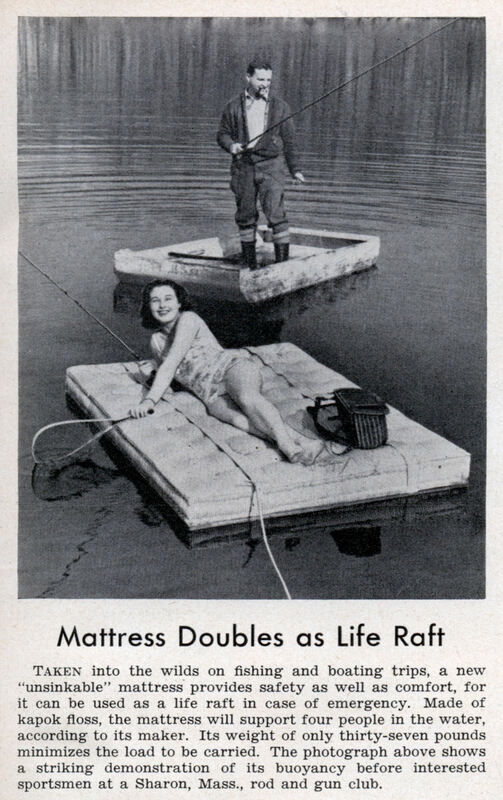 Taken into the wilds on fishing and boating trips, a new “unsinkable” mattress provides safety as well as comfort, for it can be used as a life raft in case of emergency. Made of kapok floss, the mattress will support four people in the water, according to its maker. Its weight of only thirty-seven pounds minimizes the load to be carried. The photograph above shows a striking demonstration of its buoyancy before interested sportsmen at a Sharon, Mass., rod and gun club. I like the term unsinkable being in quotes. So it really isn’t unsinkable, but we just say that?